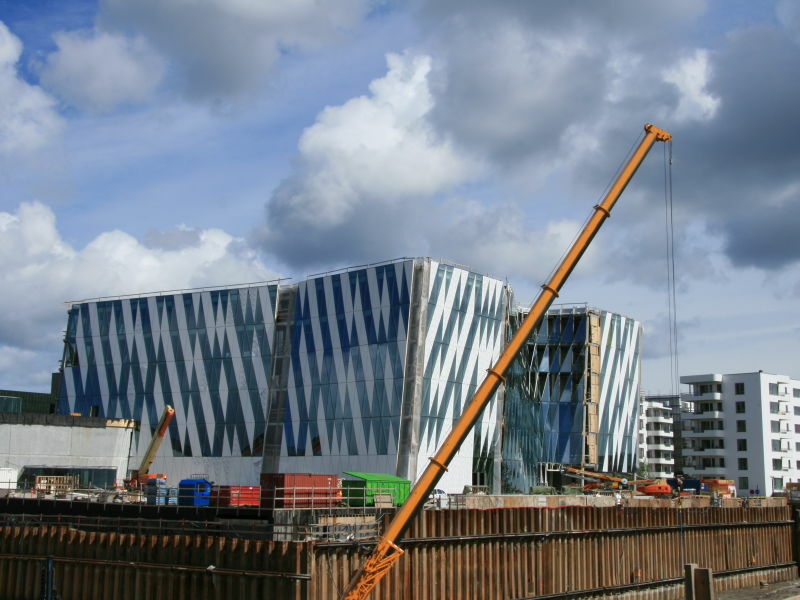 Situated right by a beautiful canal in Copenhagen, Saxo Bank's new head office is sure to be an eye-catcher when completed. 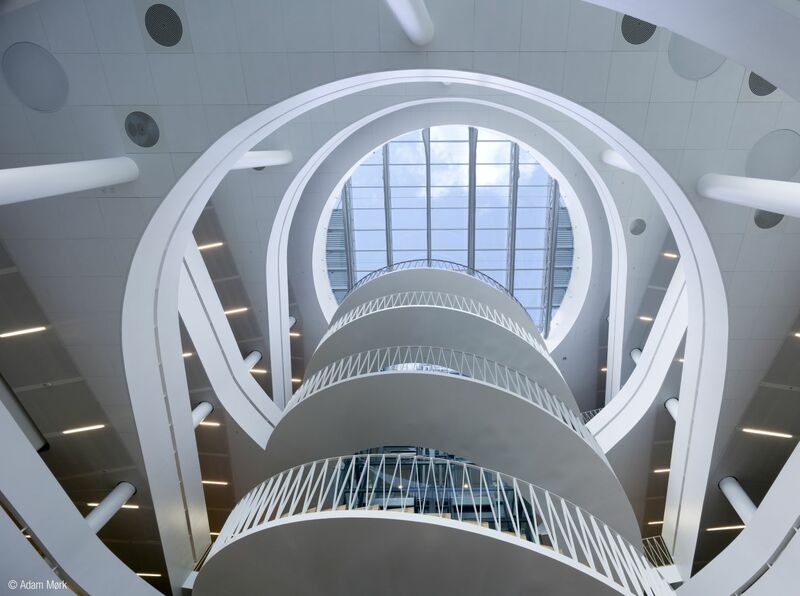 With its curved glass façades and tilted columns, the architecture of the building placed interesting challenges on the foundation. Peikko once again showed that its DELTABEAM®s can be designed to meet the most inventive requirements - from all angles. 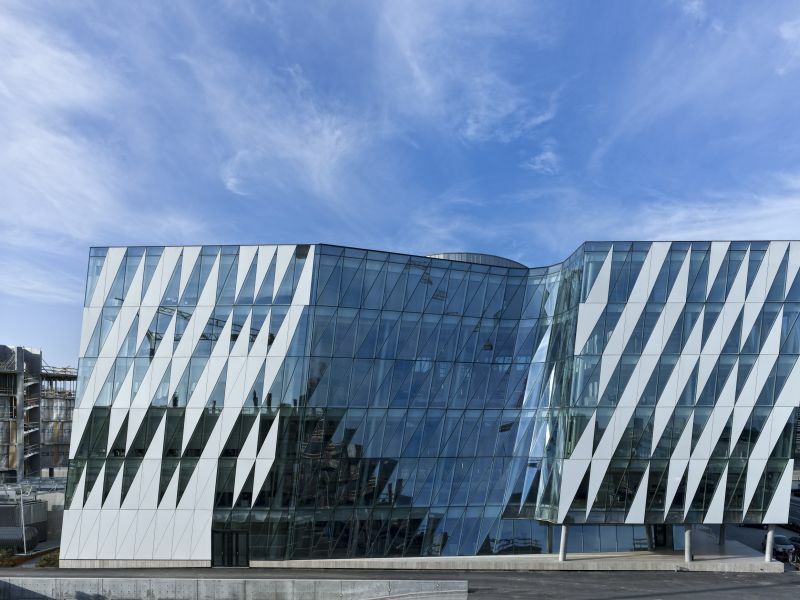 Founded in 1992, the Danish Saxo Bank is a dynamic internet bank with a strong presence in online trading of the global capital markets. 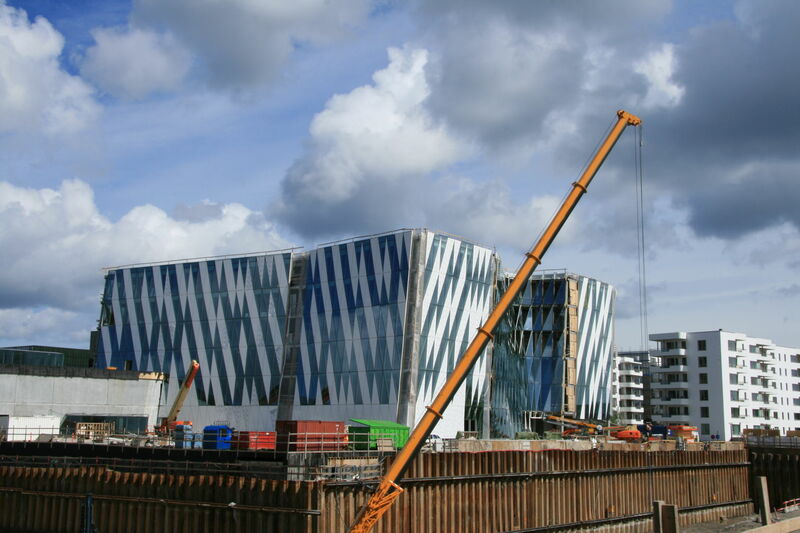 Although clients primarily meet their bank in cyber space, the physical gesture of the new headquarters currently under construction is of great importance to the bank's management. In part this is because of the building's iconographic quality, in part because of the management's strong conviction that architecture and design play an important role when it comes to employees' performance and dedication to the company. Presently, the bank's staff counts around 850 members of 35 nationalities, who serve customers from 115 countries. 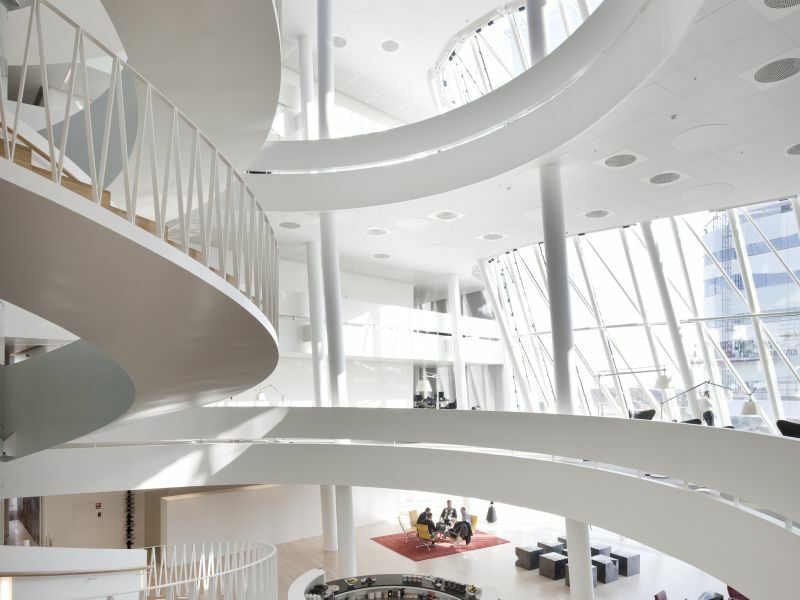 Angled architecture inspires Peikko's designers The Saxo Bank management wanted an optimal framework for its employees as well as unique, spectacular headquarters. 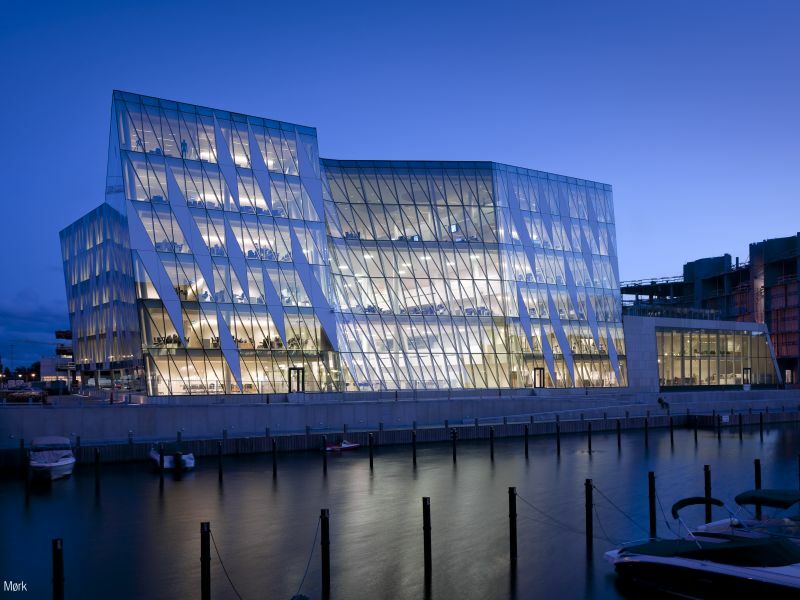 The architect chosen to design this grand accomplishment is Danish company 3XN. 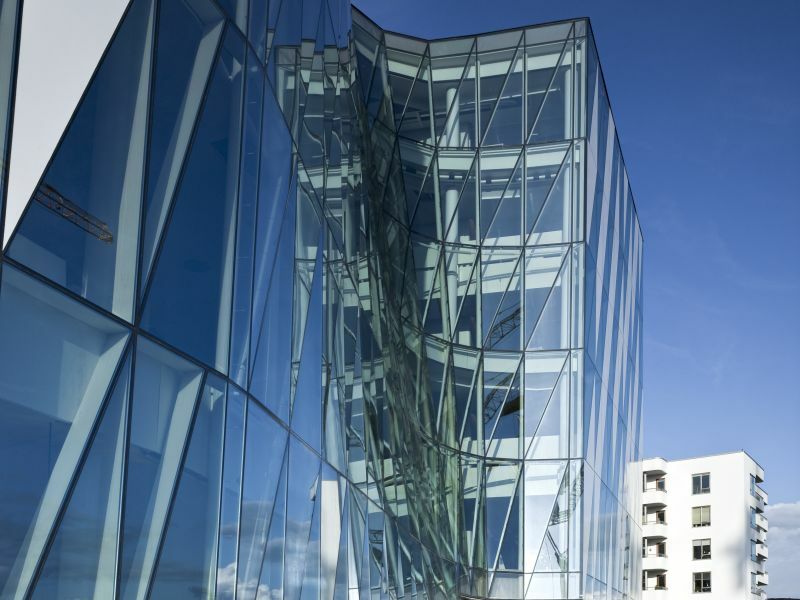 According to their team of architects, the starting point of the design was Saxo Bank's cutting edge profile. The lines explore the balance between dynamic expression and trustworthy solidity in a close dialogue with planning constraints and intentions. 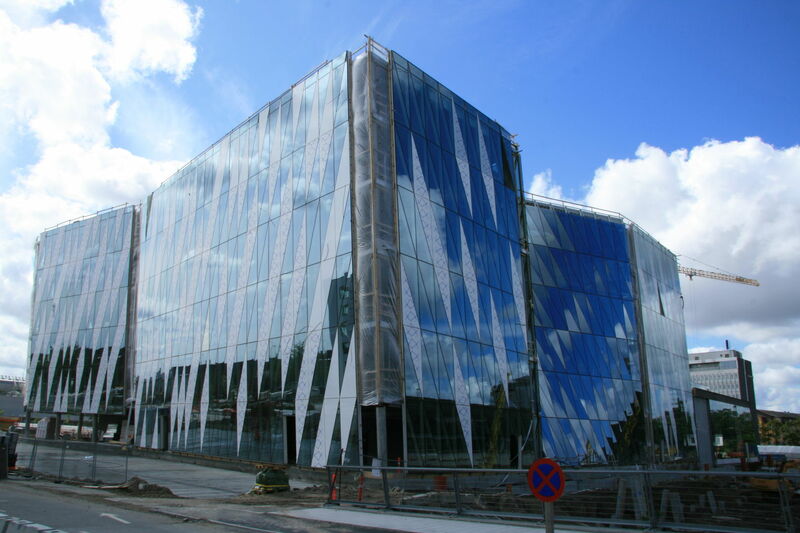 The building is conceived as two logs facing their gable ends to the canal, joined together by retracted glass façades. 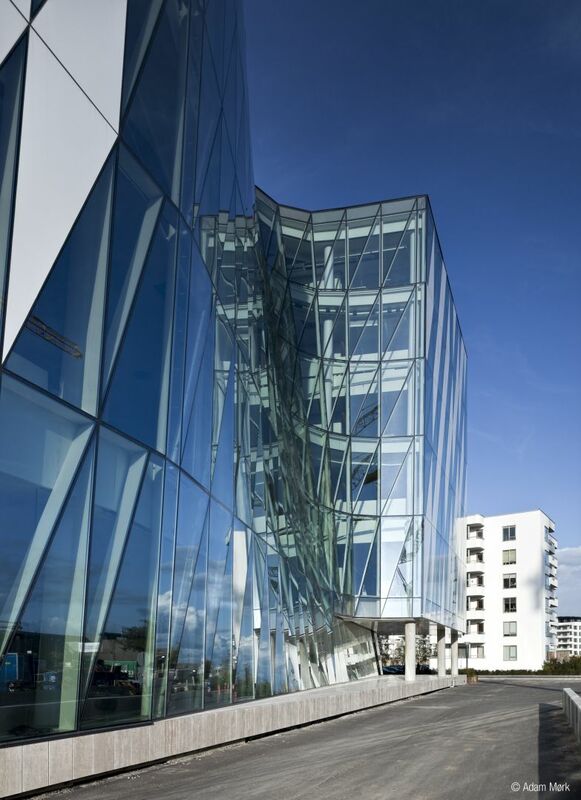 The façades are implemented as double curved glass walls, with columns that tilt an impressive 1 on 10. 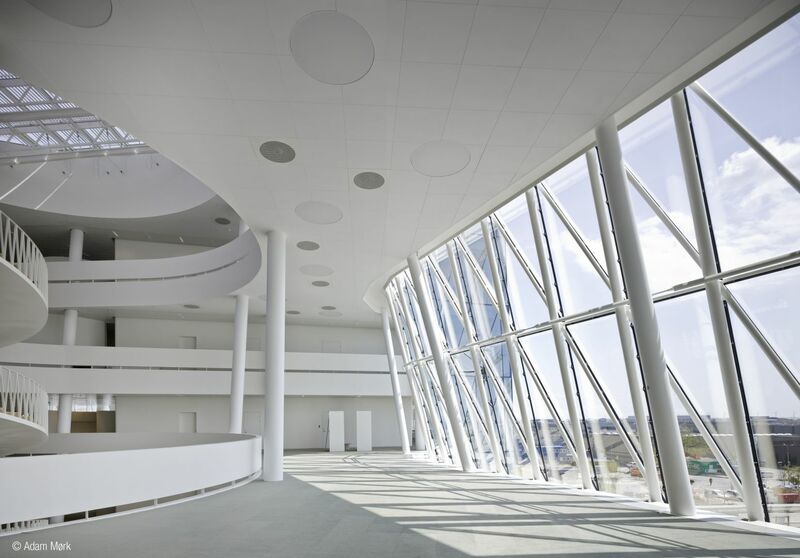 "The angled architecture of the building made it challenging to calculate, design, and produce the DELTABEAM®s needed for the project", describes Vuokko Pussinen of Peikko's Technical Sales in Finland. "The biggest challenge lay in that the angle changed with every floor, and so the beams had to be of different length for each level. The joints of close to all beams were of separate size and so standard beams could not be used." According to Vuokko Pussinen, KPC-Byg provided Peikko with well-defined technical details, which significantly facilitated the design work. With the Solidworks 3D program, models of the beams were produced and transferred to the client's flatbed in Auto-CAD for checking of the joints and beam measures. The various beam lengths required a great amount of work as all parts had to be modelled separately for each length, and the bolt holes had to be checked individually, for example. Both design as well as production required demanding manual labour in the aligning of the web holes with the joints of the hollow-core slab. 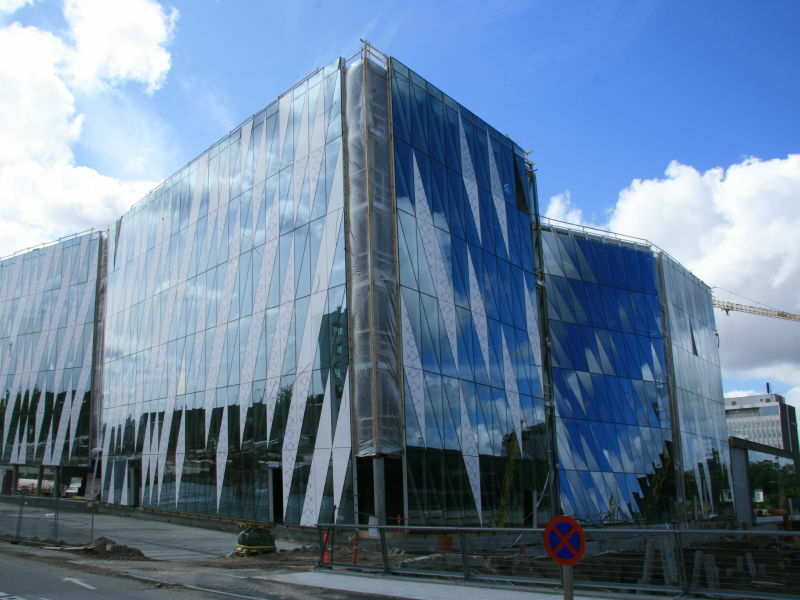 The standard length of a DELTABEAM® is 13 metres, and as the Saxo Bank building required 16.5 metre special beams, production had to join two beams together. The ready beams were then transported to Denmark as an oversize transport. "In the beginning it seemed that the schedule was very tight for such a demanding project, but it all worked out so well that in the end, we were ahead of schedule", says Vuokko Pussinen. 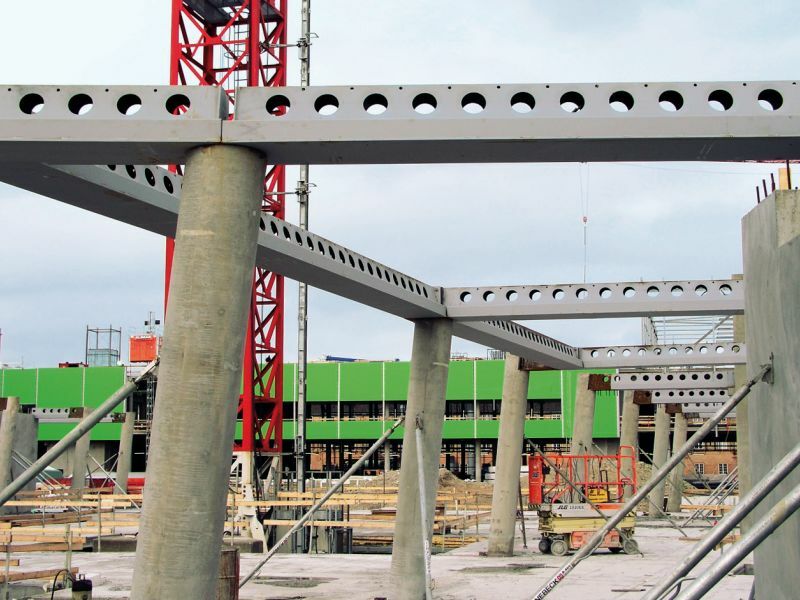 "Peikko Danmark ApS ensured that all models went to the client for checking before production was started, and we also took into account the requirements of both the client and the Danish authorities concerning local standards and technical issues such as support plates, for example." 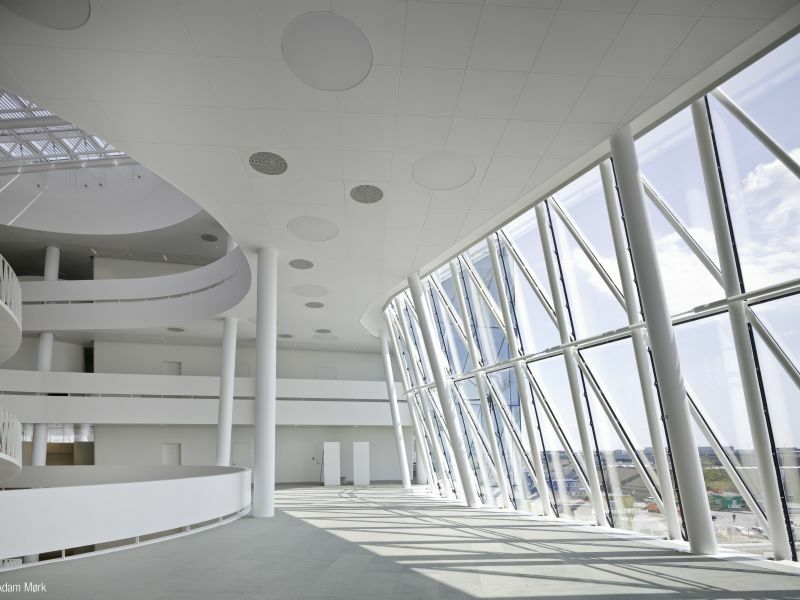 All DELTABEAM®s matched and perfect Inside the spectacular Saxo Bank building, a transparent and inspiring environment is aimed at enhancing the sense of team spirit. 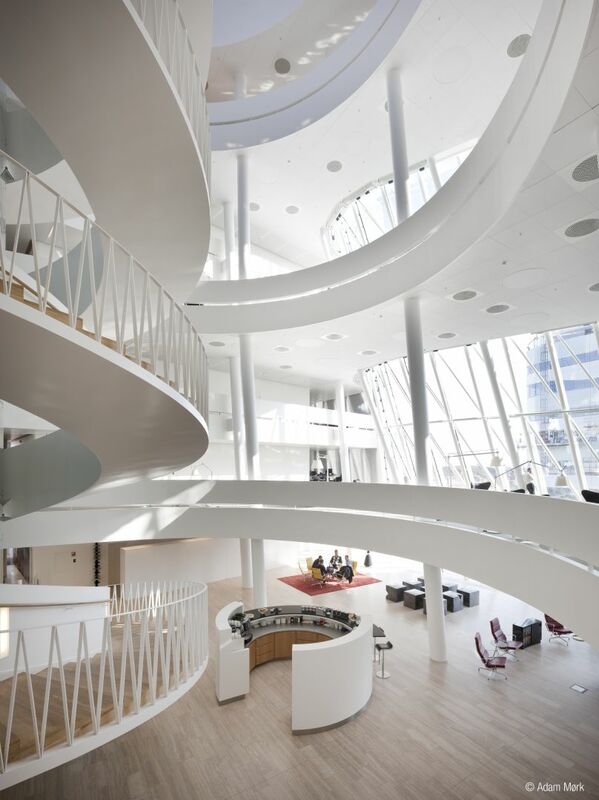 The open office floors centre round a softly shaped top-lit atrium with a winding main staircase. The main space and attraction is the Wall Street -inspired Trading Floor that matches any American stock broker movie when it comes to tense action. To successfully implement an undertaking of this calibre also requires good team spirit and cooperation between all parties involved. Jonas Høg, Managing Director of Peikko Danmark ApS, has acted as contact person in this visionary project. "From August 2006 to February 2007, we delivered 2.5 km of DELTABEAM® from Finland to Copenhagen", he says. 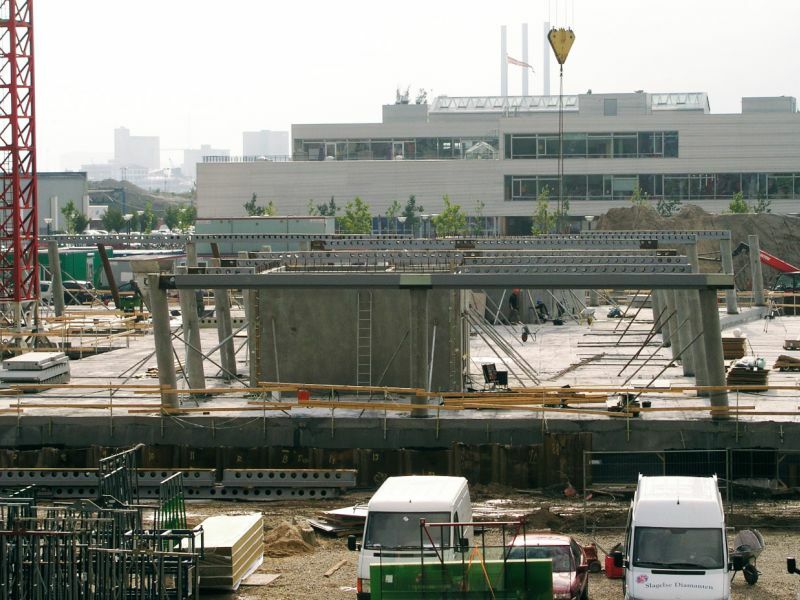 "I visited the construction site when the beams where being erected and there were absolutely no problems at all. Thanks to our top professional designers, these special beams fit right in as planned and required no alterations", states Jonas Høg with content. According to Project Chief Allan Østergaard from construction entrepreneur KPC-Byg, they were more than happy with the delivered DELTABEAM®s. "The quality of Peikko's beams is very high compared to other products on the market", he says. "We chose the DELTABEAM®s as we had noted their superior features in a previous, successful project. We are especially pleased with the excellent design of the DELTABEAM®, which makes it easy to get the concrete inside the beams". Allan Østergaard continues by telling that in this particular project, the vertical forces on the beams were substantial due to the ten degree tilt of the building. "However, we knew that Peikko has special programs for calculating the properties of the beams for even such an angle and we were confident that this would not create any problems", he explains. "All the beams were matched and perfect". Project Chief Østergaard concludes that KPC-Byg has been reassured by Peikko's way of doing business: "When Peikko promises a specific delivery date, we can be sure they will keep to it". 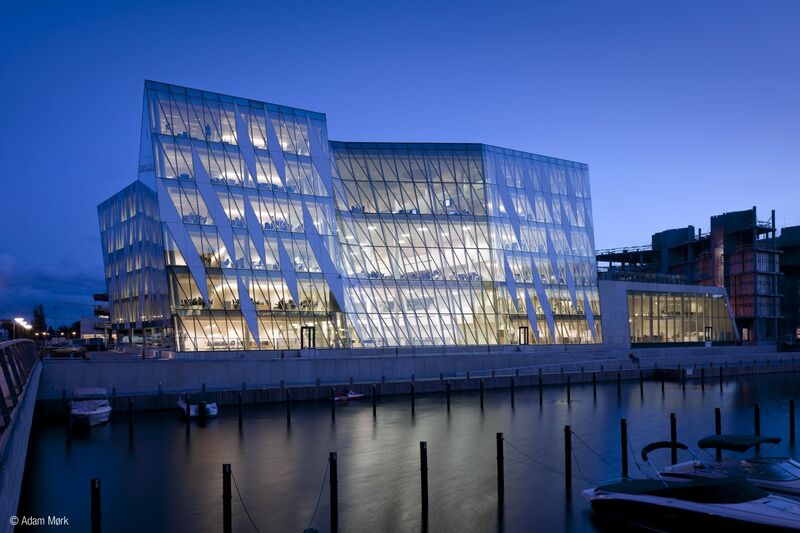 The Saxo Bank head office is scheduled to be completed in 2008 and Jonas Høg is looking toward the future with positive anticipation: "The Saxo Bank building is so unique it will surely gain the interest of both the man in the street as well as construction companies. I feel confident that much positive attention will be achieved with this successful and imposing project." 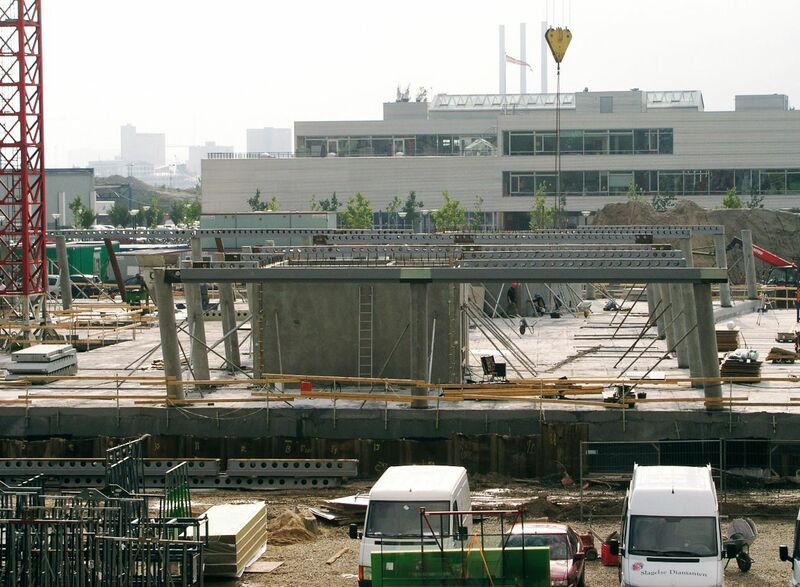 We chose the DELTABEAM®s as we had noted their superior features in a previous, successful project. We are especially pleased with the excellent design of the DELTABEAM®, which makes it easy to get the concrete inside the beams.